Michael Dobbs in debate on Brexit today! You may already have heard that Michael Dobbs, probably best known to blog readers as the author of House of Cards — but also a politician, political commentator, and the holder of three Fletcher degrees (including the PhD, F73, F75, F77) — is in residence at Fletcher this month as Visiting Professor of Contemporary Politics. While here, Lord Dobbs has already given a book talk, met students and faculty for coffee, and participated in a lunchtime discussion, and he is leading a three-session workshop on political leadership. (You can read more about the residency at The Boston Globe.) But the event most relevant for those who are not on campus will take place today (Wednesday, 5:30 p.m. EDT (UTC-4)). 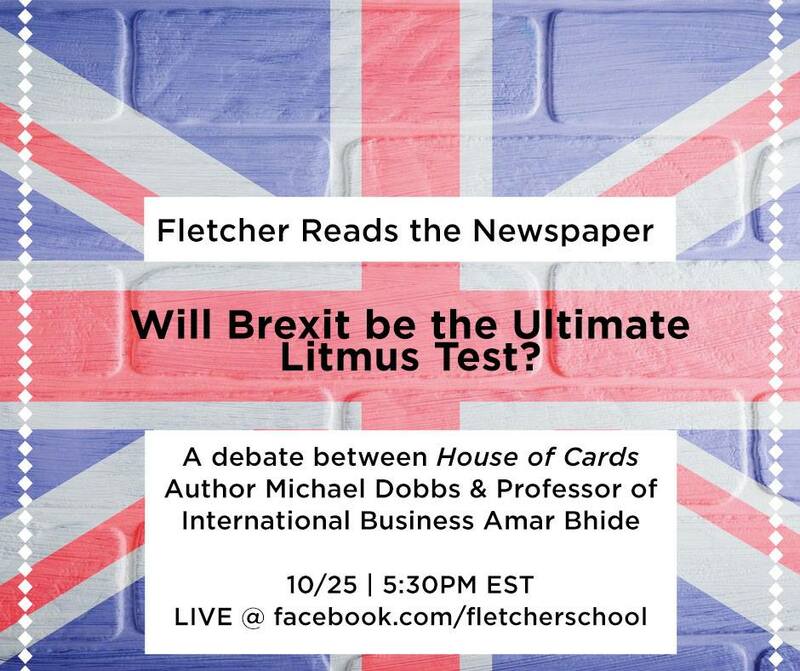 This afternoon you can tune in (via the Fletcher Facebook page) for a “Fletcher Reads the Newspaper” discussion/debate on “Nationalism vs. Globalism: Will Brexit be the Ultimate Litmus Test?” with Lord Dobbs and Professor Amar Bhide sharing their opinions on the topic, moderated by Senior Associate Dean Bhaskar Chakravorti. Please join us and watch the debate sparks fly!